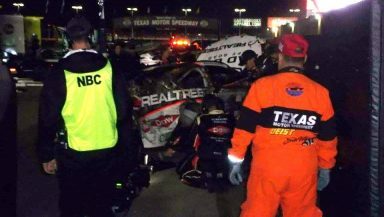 Despite having the fastest car in qualifying for Sunday’s AAA Texas 500 at Texas Motor Speedway, polesitter Austin Dillon ended the night in 37th following a hard multi-car accident on the frontstretch. Dillon, who won the pole with a lap of 28.081 seconds (at 192.301 mph), led the first six laps, which were run under a green/yellow start. Despite hanging in the top-10 for most of the night, on lap 264 Dillon’s No. 3 Chevy was hooked by the No. 4 of Kevin Harvick coming off of Turn 4 while the two were battling for the fifth position. Dillon’s Chevy was launched into the wall, and the ensuing melee also took out the No. 44 of Brian Scott and the No. 13 of Casey Mears, who took the most damage when he slid into the frontstretch grass. Meanwhile, Harvick was apologetic for the contact, apologizing in his post-race interview to the Richard Childress Racing driver. When told of Dillon’s crew chief Slugger Labbe telling his driver to “mark down Harvick’s number” and that “it was time to get mad,” Harvick appeared to brush off Labbe’s comments.